When athletes are called upon to perform in high-pressure situations many of them describe having peaked senses that they use to their advantage. They’re able to quiet their minds, zone out the audience, and make the catch. Kids with test anxietyhave the opposite reaction. There are a number of different reasons why some kids might be more susceptible to anxiety. 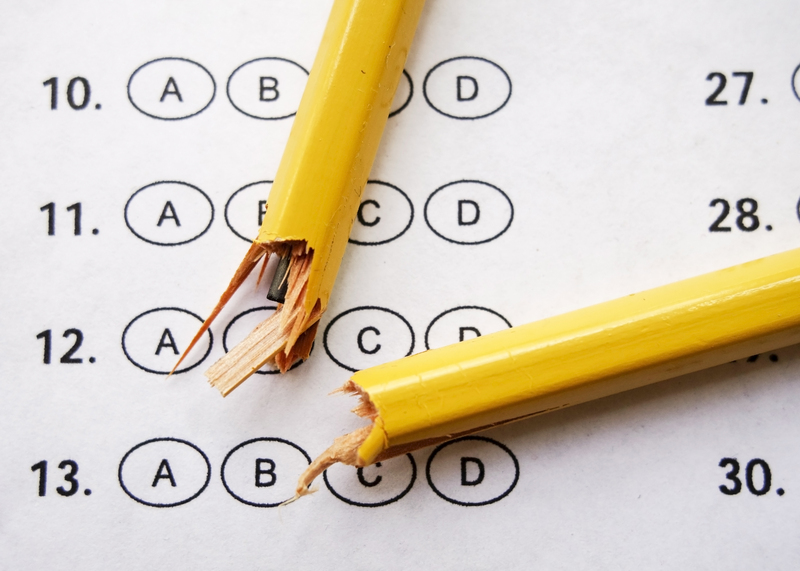 Test anxiety often goes hand-in-hand with learning issues. Children who have ADHD or a learning disability are often already feeling anxious about school, and when it’s time to take a test that sense can be heightened. “If I have ADHD and I am prone to inattention, if I start feeling anxious on top of that I’m going to have a lot more difficulty,” notes Dr. Schuster. Likewise, when a student has a limited amount of time to take a test and knows that he processes things slowly, he’s probably going to start feeling anxious. Kids worried that they won’t do well, for whatever reason, are prone to more anxiety. Kids with an anxious temperament who worry about making mistakes or performing in general—from singing in music class to going up to bat at baseball—tend to feel more test anxiety. Kids who believe that they won’t do as well in a particular subject—like girls influenced by the stereotype that boys are better at math—may also be more prone to test anxiety in that subject. Learning strategies to bolster your confidence going into the test is a good approach. Often that starts with changing how you study. Dr. Cruger says that 90% of the students he works with don’t have an effective model of studying. “What they end up doing most often is rely on their memory of what they heard in class, or review their notes by reading them over,” he says. He helps them try other more active methods that give them more mastery over the material. – Know the test format. “Imagine if you took the SAT but you never did any SAT prep. That could happen to a kid all the time,” says Dr. Cruger. “They studied the content but they didn’t know what the format was going to be, so they don’t feel like they are prepared.” So kids should try to find out what format the test will be. Multiple choice? True or false? Essay? A combination? Just knowing the format will help them feel more prepared and take away the shock they might feel when they are handed the test. And if it is possible to take some practice tests, do it. – Reorganize the material. Try to think about what the main ideas are in what the class has been studying. Outline the big events and issues, and think about the themes that unite them. This is a more active style of studying that helps kids think about what they have been learning in a different way from how it was presented, which will give them a richer understanding of it. And the better you understand something, the harder it will be to stump you. – Think about possible questions. Predicting and answering questions ahead of time helps kids gain more mastery over the material and feel more confident. But try to think flexibly. “We like our tests to require people to solve the problem, but often not in the way we taught them the problem,” warns Dr. Cruger. So if you know you will have some essay questions to answer, try to predict what the topics might be and practice writing your answer ahead of time. If you know there will be some word problems, think about how the things you’ve learned in class might be turned into a word problem. Look at the word problems that already came up on homework assignments. Even after having done all you can to prepare, it’s still good to be armed with some strategies for getting through the test and putting the brakes on any anxiety you might start feeling in the moment. If it’s a multiple choice test, read each answer and then cross out the ones you know aren’t right to help yourself narrow it down. Pick an answer and stick with it—we all have the tendency to second-guess ourselves and it can lead to wasted time and wrong answers. – Practice calming techniques: Sometimes kids like to bring things like worry stones into tests that they can use almost like a stress ball. Practicing deep breathing and using mindfulness techniques can also be effective. – Accept when you don’t know something. Sometimes the best way to manage your anxiety is to accept that you don’t know the answer to a question and move on. If you feel like the test was unfair and didn’t give you a chance to show your knowledge, you can advocate with the teacher later. – Accommodations Some kids who really struggle with test anxiety may also be eligible for accommodations during test time. For example, some kids might need to get up and take a break during a test if they are really starting to panic and need to calm themselves down. Sometimes kids get more time because they aren’t working at an optimal speed because they’re experiencing low grade panic throughout the test. Kids may even be eligible for a modified version of the test. If they don’t understand the rationale behind a new study method, they probably aren’t going to adopt it, so parents and professionals working with kids should be explicit about how a new technique might be helpful. But when kids start feeling like they’ve studied well and they know the material and they have strategies to fall back on if they need them, their attitudes going into a test will transform. And having the right attitude is important. “I think the best test-taking mindset is something along the lines of ‘I’m a monster, I’m going to kill this test. There’s no way I can be fooled or do badly,’ ” says Dr. Cruger. Originally published on Child Mind Institute.